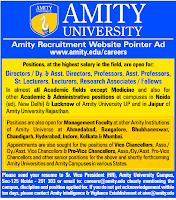 Amity University requires Directors / Dy. & Asst. Directors, Professors, Asstt Professors, Sr. Lecturers, Research Associates/ Fellows at campuses in Noida, Lucknow and in Jaipur.